After reading Part 1 & 2 about my beliefs on Christmas and how Dominican’s celebrate differently than North American’s, I hope you’ll appreciate how absolutely at peace I was with my decision to be abroad for Christmas in 2014. Of course I missed my family and friends. More than anything though, all I could wish for was that every single one of them was enjoying Christmas in whatever capacity brings them happiness and no stress. Christmas morning I slept in until about 9am. When I woke up, I immediately called my family to say Merry Christmas and chat for a bit. My apartment was ‘decorated’ with clothing hanging to dry on a drying rack after being at the beach the day before. My mind was rested from a good night’s sleep and the sun was shining (when I finally opened the curtains!). Amazingly it was just like any other day except fewer people in the community were working and stores were closed. And I felt … Happy. Later that day, with a handful of other students and friends from IIC Casa Goethe (my Spanish school), we hopped in a carro publico and made our way about 30 minutes outside of Sosua along the coast to a small community called Saboneta. On the outskirts of town we were met by our guide and her jeep, waiting to take us to her farm where we would meet the horses and begin our day. We all got saddled up and acquainted with our horses and then slowly set off through the streets of the little town toward the mountains. Locals were sitting on their porches chatting away as normal. Kids were playing in the streets. Bachata and Merengue music could be heard around every corner. And we clip clopped through waving and saying ‘Feliz Navidad’ to the locals. Once we set off up the first hill, our guides checked in to make sure we were all doing ok in the saddles and then shortly after that we had our first opportunity to go fast, straight up a large hill. I’ve been horseback riding only about 10 times in my life and I’ve never gone any faster than a saunter, so this was particularly exciting for me. And off we went straight up the hill. How exhilarating! The strength, speed and agility of the horse, balanced with the concentration it took from me to stay on her … amazing! Do it again! Do it again! (it wasn’t time yet though) We climbed a fairly well-groomed dirt road for a good half hour and then headed down into the valley where we got the first glimpse of the river that we would be crossing with our horses. This was also the rest stop for the horses and a relaxing snack and dance break for us. Break time for the horses. Dance break for the humans. 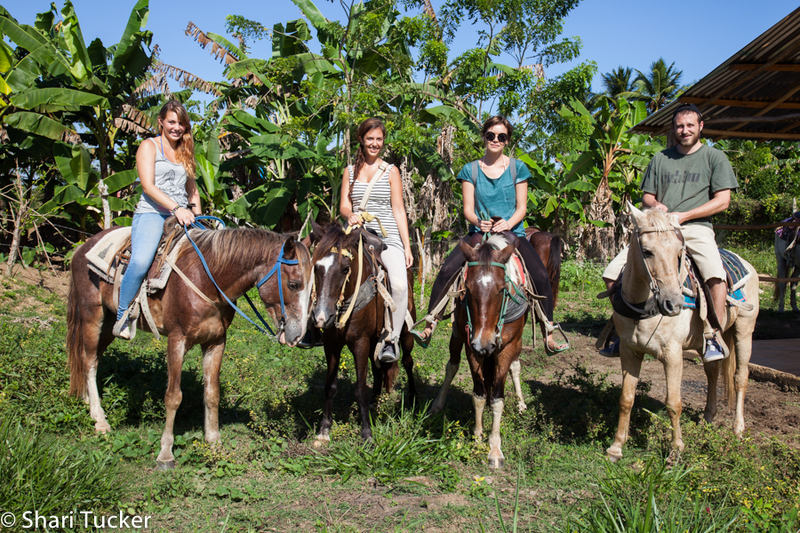 After a leisurely break, we mounted the horses and started our true adventure through the river and jungle of the Dominican’s beautiful mountains. The horses navigated their way down a short, slippery and rocky slope to the river and then in we went! No time to reconsider, the horses were following the leader and he was already on the other river bank! Each of the horses daintily waded into the water stumbling on rocks and regaining balance almost with every step, but never losing a passenger! The water was up to the horses’ tummies which meant our feet were fully submersed in the river and occasionally up to our knees. Don’t be fooled though, the rest of our bodies didn’t stay dry with the splashing from our own horse as well as whoever happened to be in front. As dainty as they may be when they are trying to choose the path of least resistance, they sure can make a splash as they clomp into a river. 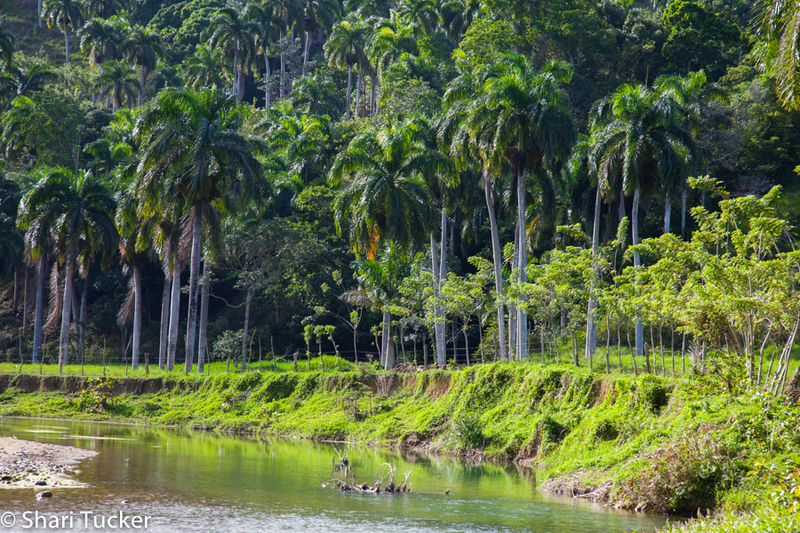 We quietly followed the leader along the sandy banks of the river for awhile and then criss-crossed back and forth down the river to follow the best pathways along the beaches, rocky banks and through the jungle. More than once I found myself drifting off into a relaxed day dream as I bumped methodically along the pathway surrounded by large leafy trees, the bubbling sound of the river passing by and birds singing in the distance. My mind completely relaxed and I was able to just enjoy the freshness and revitalizing spirit of nature. I’m not sure if others in my group felt the same or not, but they were equally quiet and there were times when no one in the group spoke for five or more minutes as we trotted along the trails. It was complete human silence, only broken by the sounds of nature. 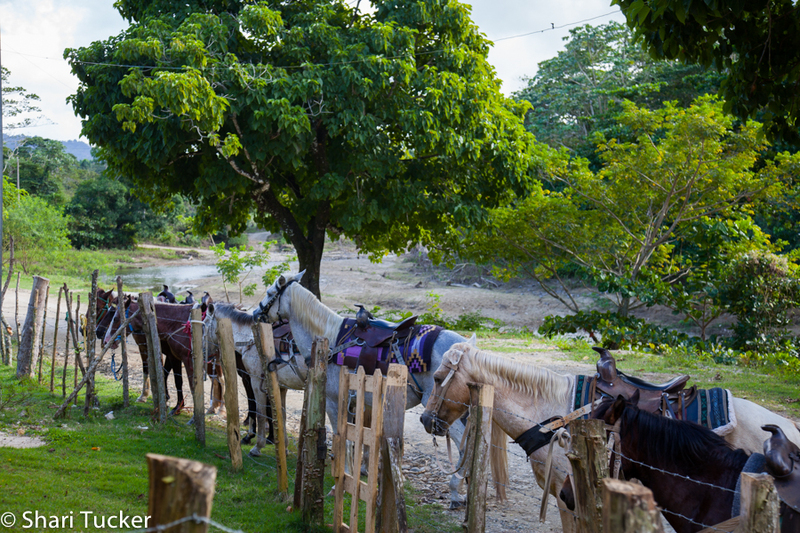 After traversing the river and riding through various different types of foliage, we reached an open field where we were allowed to run with our horses to the other side where we would meet our final path back to the main road. A couple of the others were seasoned riders and took off at the speed of light. Me and my horsey, Puerto Plata, started with a trot and then next thing I knew she was going full speed ahead. I was a little torn between fear of losing my balance and the exhilaration of going so fast. In the end, exhilaration won as I’ve decided that I love horseback riding and need to find more opportunities to improve my skills so that the fear of falling off doesn’t inhibit me from going as fast as the horse can take me. We all met up at the last trail and clip clopped our way slowly back through the little village to the farm. I can’t really put in to words how much I enjoyed the three hours we spent amidst nature with the horses, but I know that for Christmas 2014, I found my holiday happiness, my tranquility and my sanity on a horseback trip through the mountains and rivers near Saboneta, Dominican Republic. It's a cat … oh wait, no it isn't!